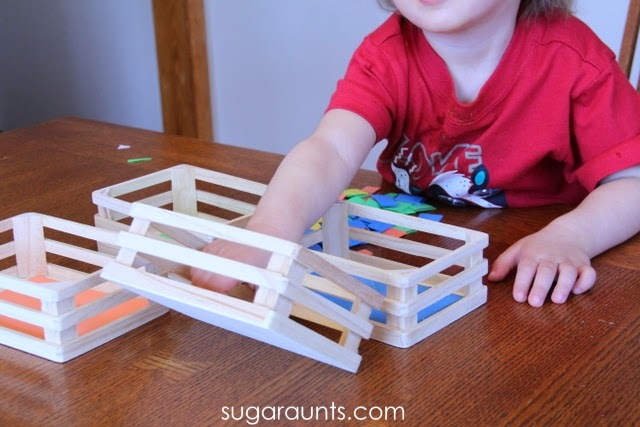 If you've been following this blog for a while, you know how much we love to do fine motor activities. 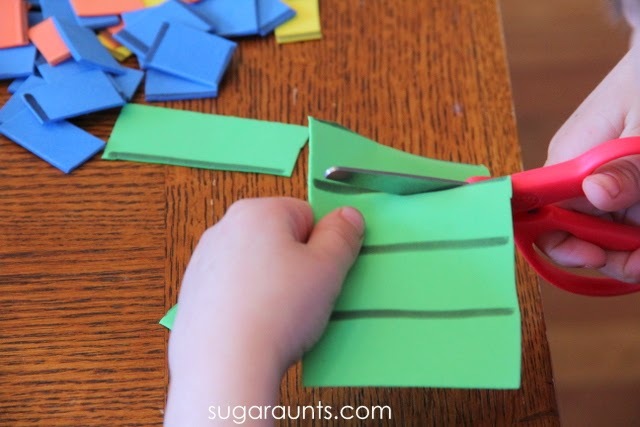 Scissor activities for kids is one of our favorite fine motor topics and we've got a bunch of creative ways to practice them! 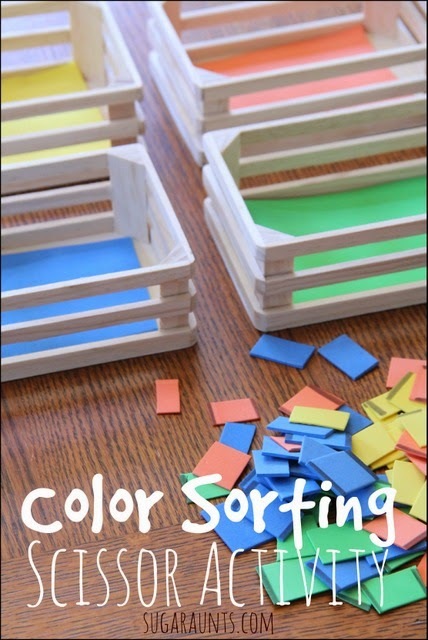 This fun fine motor color sorting activity was part of prep for another activity we were doing (watch this space to see these foam squares again! ), but we had so much fun with it, that we had to share! 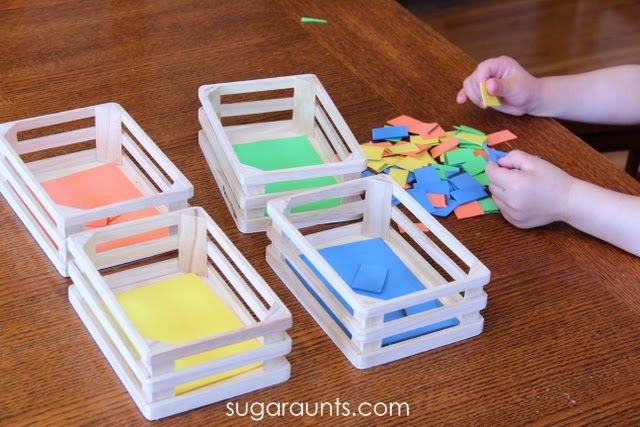 We started with the wooden crates from our Melissa & Doug Food Groups . 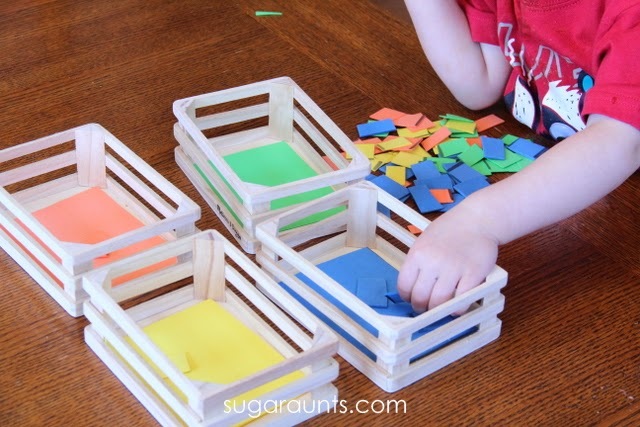 Besides being a totoally fun pretend play toy, the packaging is completely re-usable and perfect for sorting activities. We shared the picture of our four crates on Instagram and had some great comments about how awesome these crates are for all kinds of play. I lined the bottom of the four crates with different colors of foam sheets , and drew thick lines on matching colors of foam sheets. This was a great way for Little Guy to practice his cutting with scissors. The thickness of the foam sheets is great for new scissor users because it provides greater resistance and therefore slows the scissors more than regular paper. The thickness of the lines is another way to grade down the cutting task for new scissor users. Slower cutting speed is good when the little one needs verbal and physical prompts to hold the scissors correctly, and how to position their assisting hand on the foam. Little Guy is working on his scissor skills and needs prompts to hold the foam/paper close to his body and to move the scissors when he's cutting, and not hos whole upper body. Strait lines are a good start for him for practice. 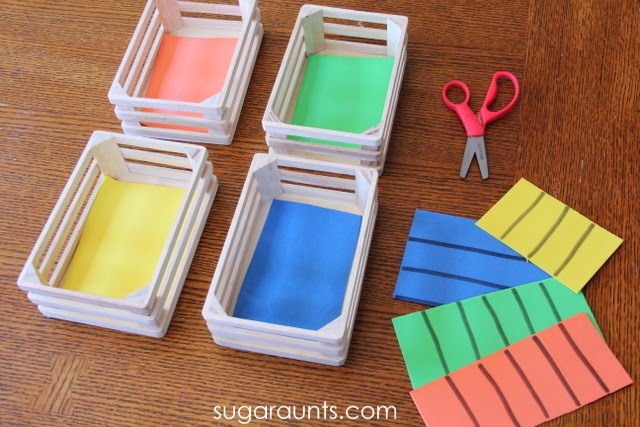 Older kids or those who are doing a little better with their scissor skills would benefit from thinner lines, curved lines, or even using construction paper instead of the foam sheets. Once we had all of the foam squares cut out, we were ready for our sorting. This interested Little Guy for a little while, but Baby Girl was the one who was really into this part of the activity. She was able to sort the colors into the correct bin. We worked on naming the colors along the way. 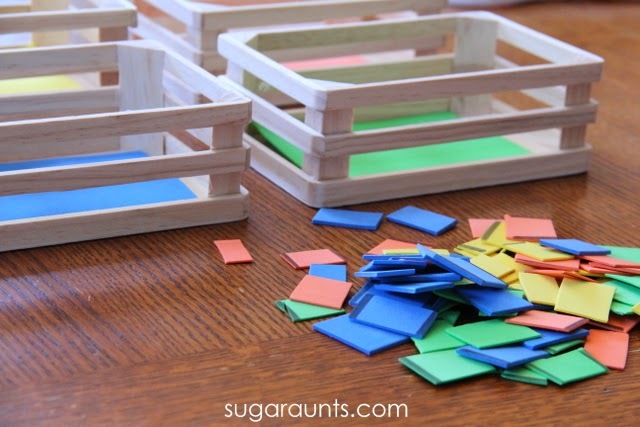 Sorting the squares was a fun way to play and learn! We had a great time with this cutting and sorting activity. Let us know if you do this at home, we would love to hear about it! Stop by our Scissor Skills Pinterest board for more ideas. Follow Sugar Aunts's board Scissor skills on Pinterest.